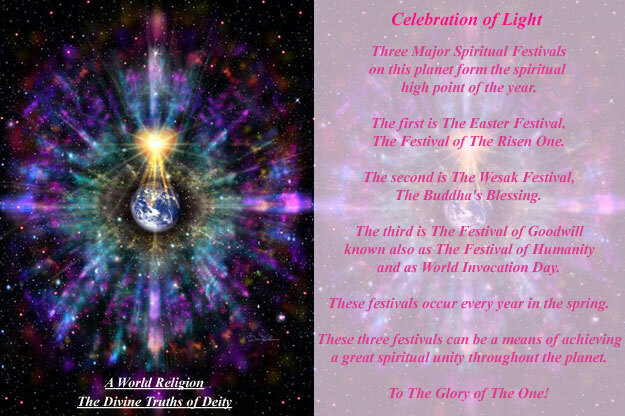 The first of the three major spiritual planetary festivals, The Festival of The Risen One, is celebrated at the full moon during Aries and in the western hemisphere has been observed traditionally as Easter, on the following Sunday. This Festival is in present time the Festival of the Risen, Living Christ, and honors the spirit of resurrection and the birth of Divine ideas. The consciousness of the heart ~ the energy of Love as represented by the Spiritual Hierarchy ~ is recognized, and the nature of Gods Love is emphasized at this time. The Forces of Restoration are particularly active during the time of the Aries Festival. These forces emanate from the MIND of God; they are connected with the intelligence principle in the divine nature, stimulating human intellect. This restorative energy is especially creative in nature and carries the Life which produces the birth of forms. It relates to stimulation of the mass intelligence and causes humanity to think, plan, and take action, producing neither good nor bad results ~ simply the awakening of our minds so we will take intelligent action. The action itself is necessarily dependent upon the type of mind of those who respond to the Forces of Restoration. It will be conditioned by their point in evolution, the racial and national background, tradition, and religious and cultural reactions. These forces are now active in every land, frequently producing increased initial difficulties but leading eventually to a definite reorganization of the national life. The effects are primarily physical. Their objective is the production of the new Earth and all the outer evidences of an inflowing New Life.